One problem I often see in the forum is that students keep creating new topics every time they post something. Then, instead of all their posts being in the same thread, they end up in different places all over the forum. Now the continuity of the posting story is lost, and nobody can follow the story since the individual posts are not connected. This short tutorial explains how to keep your posts together and organized so that they can be followed easily. There are two things in the forum which are often confused – topics and posts. A topic is the overall heading for what you want to talk about. Let’s say you are posting about the Thai Massage course which you are taking. ===> Now you create a topic – but only ONE TIME. Your topic has to contain your full name and the subject of your posts. 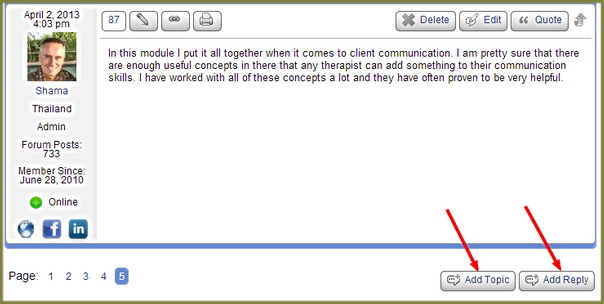 For example: “Jane Doe’s Thai Massage course progress report“, or something like that. Now everyone knows who is posting and about what. From now on all your posts go under this same topic. There can be dozens of posts under a particular topic. They all follow each other and are neatly organized, all in one thread which is described by your topic heading. DO NOT click on “ADD TOPIC”, but instead click on “ADD REPLY”. Then a new posting window will open right under the previous post, and your next post will follow the previous one. When would you start a new topic? Let’s say you start a new course, the FOOT MASSAGE course for example. Then you start a new topic and name it something like “John Smith’s Foot Massage experience”.